Accidents happen when we least expect them—at Alpine Towing & Storage we're standing by to help you in your time of need. Based in Oshawa, we provide prompt, professional towing and storage services to drivers throughout the Durham Region, including Pickering, Ajax, Whitby, Clarington and Port Perry. We also perform vehicle repossession throughout the province of Ontario. Call us for 24/7 emergency roadside assistance. We're on scene for most calls within 30 minutes! With our light-duty and flatbed trucks we are able to tow a wide range of vehicles – including everything from small cars to full size trucks – quickly and cost-effectively. Plus, our team of experienced operators are standing by 24 hours a day, 7 days a week to assist you. Do you have a scrap vehicle taking up space on your property? 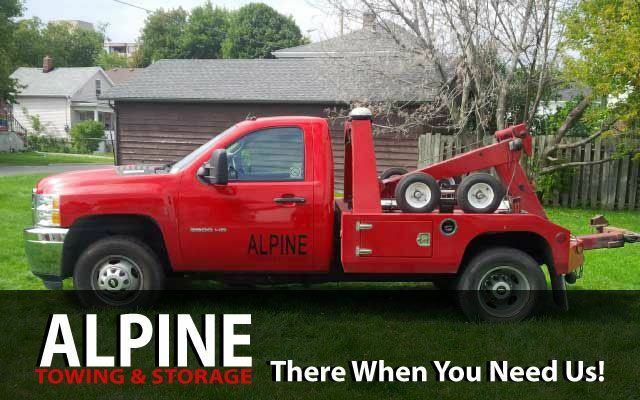 At Alpine Towing & Storage we pay top dollar for junk vehicles throughout Oshawa and surrounding areas! We also help local businesses and carparks with illegal parking problems, towing away unauthorized parked vehicles. Get in touch with us for all your light-duty towing needs.